The recent Wall Street Journal article "A Portfolio That's as Simple as One, Two, Three" got us thinking about the possibilities of using just three ETFs to build a portfolio. But the article was sparse on examples. It provided only two specific portfolio allocation ideas: 1) 40% U.S. stocks, 20% international stocks, 40% total bond market and 2) an allocation using an all-country equity fund (e.g., ACWI) plus a U.S. bond fund and an international bond fund. That left us hungry for more actionable asset allocation ideas using three ETFs. We also wanted to explore portfolio allocations using other types of assets. This article explains how we looked at a full range of portfolios using just three ETFs, and which portfolios performed best. 1. Choose a list of global asset classes from which to pick the three ETFs. 2. Create portfolios by choosing every unique combination of three ETFs from the asset class list. 3. Apply an allocation (% weighting) to each ETF within each portfolio. 4. Calculate risk and return metrics for each portfolio. 5. Identify winners and losers based on risk and return. We chose eight asset classes and applied a data set with 40 years of history through 2012. Since the ETFs listed below are not 40 years old, we've used an appropriate mutual fund or proxy to complete each data series. Are there asset classes we've missed? Sure, but these eight should give us some idea of where to look first. If you can't imagine yourself owning some of the above asset classes, then we hope there will still be some portfolio combinations worth considering. Using a bit of combinatorial math, there are 56 possible combinations if we pick three asset classes at a time from a set of eight. To see the full list of 56 portfolios, visit Portfolios Using Just 3 ETFs: List of 56 Portfolios based on Global Asset Classes. We've applied an equal weight of one-third (33.33%) to each item in each portfolio. This equal weighting is a simplification; there are many other allocation possibilities (e.g., 60%/20%/20%, 20%/20%/60%) but this allows us to explore a manageable number of portfolios and should give us an idea of what looks most promising. Then we calculated the risk and return for each portfolio using annual data and the assumption of annual rebalancing and no transaction costs or taxes. Which three-fund portfolios had lower risk and higher return? Here's what we found. The top left of the chart contains the portfolios with the lowest risk and highest return. Portfolio #11, the highest return portfolio, would have increased 82-fold (8,200%) over the 40-year period. We're aware of the particular behavior of the gold market in the early 1970's. Portfolios #1 through #21 contain gold, and Portfolios #22 through #56 have no gold. Portfolio #40 offers significantly higher risk without much extra return. 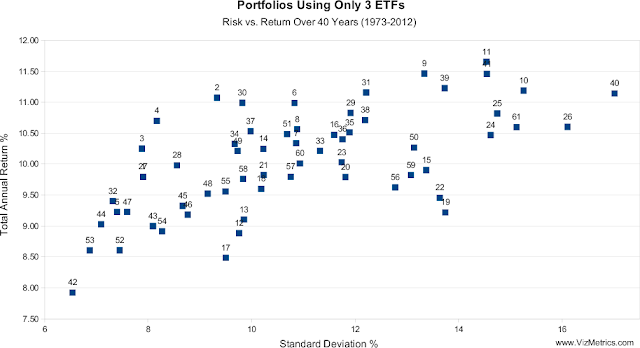 Portfolio #19 offers significantly lower return compared to other portfolios with similar risk (e.g., Portfolios #9, #39). The lowest return (and lowest risk) portfolio, #42, would have increased 21-fold (2,100%) over the 40-year period. To see detailed descriptions of all 56 portfolios with the Risk vs. Return scatterplot, visit Portfolios Using Just 3 ETFs: Risk vs. Return Scatterplot. Several portfolios, such as #30, have offered solid returns of 11% per year at below-market risk. Looking at volatility, all 56 of the 3-ETF portfolios in this analysis were less volatile than holding the single asset class of U.S. equities, which has a standard deviation of 18.1% (!) over the 40-year period. Looking at total annual returns, most of the portfolios in this analysis had a higher return than the U.S. equities asset class, which had an annual return of 9.5%. The top-performing portfolios are worth further analysis to see if additional optimizations can be made with asset selection, factor tilts, or other variations.